The Best Koi Come From Kloubec. It's a fact. We want to be your supplier of beautiful, healthy Koi. Offer pets to your customers from the breeder who stands behind every sale. History and Experience: We are a real family-owned business with over 30 years of aquaculture experience. Benefits of the Iowa Farm: With 80 acres of mud-ponds in the heart of the Midwest, Kloubec Koi are winter hardy, ideal for any climate. Our State-of-the-Art quarantine facility ensures that customers receive Koi that are free of parasites, and acclimated to a retail tank environment. Our indoor hatchery allows us to produce koi each year through a comprehensive artificial breeding program. On average over 15 million koi fry are hatched every year. Our unique harvest techniques minimize stress and damage to koi during transport into the greenhouses. Koi Health: Our farm policy is to randomly test our stock during the year through qualified and certified laboratories. Kloubec Koi Farm has NEVER had an outbreak of KHV or SVC, and we maintain our excellent record by implementingstrict health regime and practices before our Koi go onto the market. You will receive live and healthy Koi from Kloubec Koi Farm! 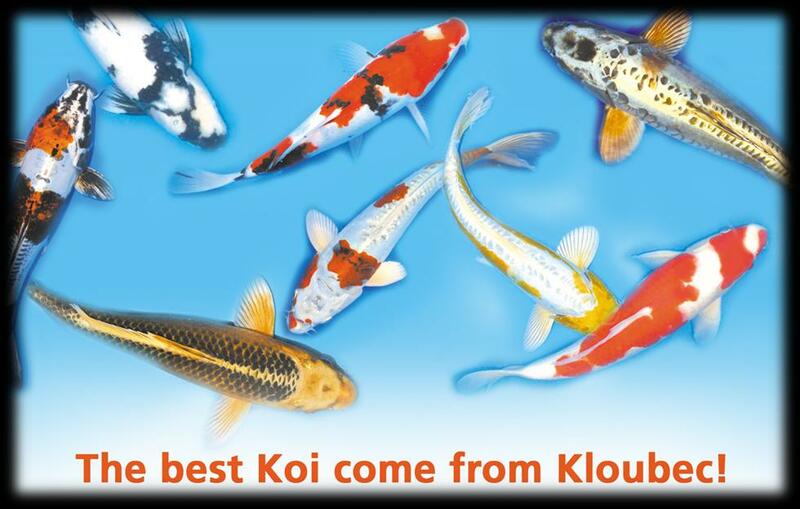 Japanese Bloodlines: All Kloubec Koi are produced from hand-selected parent Koi from Japan. We raise the common varieties as well as many of the unique and unusual varieties. Our customers enjoy receiving a good mixture of varieties in every shipment. Shipping: Our exclusive UPS shipping rates actually save dealers time and money. Deep discounts for 4 or more box orders. Shipments generally arrive at your store by 10:30 AM. The shipments are packaged late in the evening and arrive in the morning, during the coolest part of the day. Kloubec Koi Are Winners! : Many of our customers have earned numerous awards at Koi shows throughout the country. Year after year the Kloubec Koi Farm has taken top honors against other koi breeders at National Koi Breeders competitions.